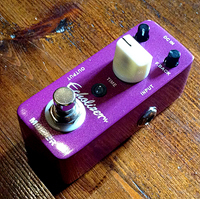 The Mooer Echolizer is a digital delay that has a longer delay time than the Mooer Ana Echo although the sounds produced are not that different. The main difference is the maximum delay time between the two pedals. The Mooer Echolizer featured here has a maximum delay time of 600ms twice that of the Ana delay pedal. (The Mooer Ana delivers a max delay time of 300ms). 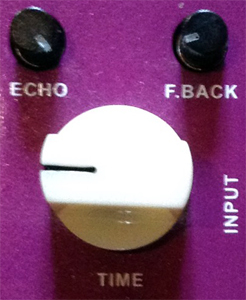 What you get is a workmanlike delay with a standard three-knob array for echo volume, delay time and feedback. 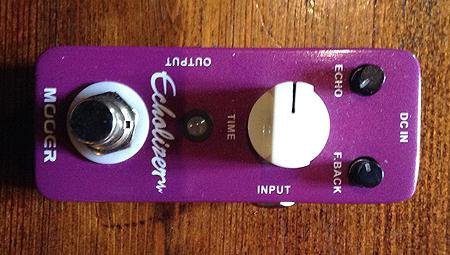 The sound of the Echolizer goes from a short slap back country type of echo to a cavern sounding echo with an almost continual delay that breaks up warmly just before ending. This makes the pedal useful in long washes and ambient sounds with the added advantage of being able to achieve a country or rockabilly slap back at the other end of its delay range. The small footprint of these pedals (There is no room for a battery in the Mooer range) makes the space available for the control knobs smaller than is usual on guitar pedals of the past. Mooer have solved this problem in a simple fashion by making the echo and feed back knobs small with edges like knurled coins that are very easy for sweaty fingers to grip. This leaves space for the larger control for delay time, possibly because this is the control most likely to be adjusted.